Safety and Security Films - they are effective and built to protect! Home and car owners have identified window tinting as a solution to many on-going problems including safety and security. You get the peace of mind knowing your invisible protective shield is on the job even when you are not thinking about it. Due to technological advances in window film development, some films are designed specifically for certain applications e.g. protective films for security, tinted films for privacy and UV films for sun protection. There are also multipurpose films designed to suit many applications as an all in one solution. Our range of safety films is designed to transform any ordinary glass into safety glass. This invisible film has averted many a tragedy. All of the safety films conform to the AS/NZS2208 safety standards. A few years ago all NZ schools had safety films fitted in areas of danger from glass breaking. This is cheaper than replacing ordinary glass with safety glass. The safety & security films used by Window Film Group comply with the Australian & New Zealand Standard 2008. Safety films are designed to resist penetration and keep glass in place in the events of break-ins, storms or earthquakes. These films are available in either clear or with a tint. All schools in NZ had Safety films installed, where glass posed a threat of injury. This option is cheaper than replacing glass. Some Superior Safety & Security Window Films are designed to deter criminals from smash and grab theft. Our security films help to prevent glass from shattering when struck, creating an element of surprise to a potential thief. Traffic accidents happen every day, even to the most responsible drivers. In a split second, lives can be changed. Unprotected side windows can easily shatter, projecting glass shards into the car. Glass shards can cause significant lacerations and eye injuries. Safety and security film provides a strong, protective barrier between you and the glass in the event of an accident, the window may still break, but the glass fragments adhere to the film. With a safety and security film installed car occupants are shielded from dangerous flying glass shards. 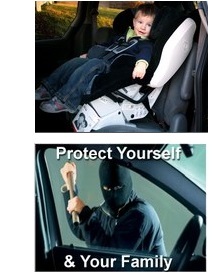 In less than five seconds, a thief can shatter your car window and rob you of your valuables. By holding broken glass in place, safety and security film slows access to the vehicle interior. The increased time to break-in and additional noise call attention to the thief. Don't be a victim! Protect your family, yourself, and your valuables.